The fish counter continues to register alewives making their way up the Supply Ponds fishway. 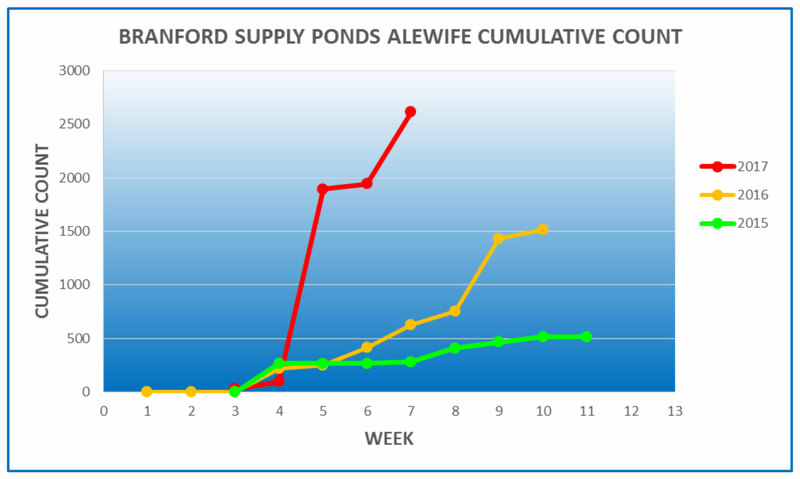 For the week ending May 2, the counter indicated that an additional 669 fish made their way into the Supply Ponds for spawning. We are currently over 2,500 alewives for the season – a substantial increase over the totals seen the past five years. And it is still early in the season! The alewives should continue their run through the end of the month. All these fish should mean an ample food supply well for our local osprey population. Enjoy the beautiful late spring weather while you can! Get out and explore some of Branford’s open spaces – the alewives certainly are!